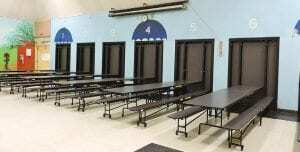 Dye Elementary’s new cafeteria tables were installed as scheduled during spring break. FLINT TWP. — Students and staff at Carman-Ainsworth’s Dye Elementary School returned from spring break this week to find sturdy new tables installed in the cafeteria. Randels Elementary was supposed to get them too but will have to wait a while longer because the measurements were wrong and their tables will have to be reordered. The project was bid out in August 2013 and the school board approved the low-bidder in January of this year. Two bids were received and Shiffler Equipment Sales of Ohio submitted the low bid of $64,637. Dew-El Corp., based in Holland, MI, submitted a bid of $73,214. At the time of bid approval, plans were announced for table installation to start and finish during the spring break (April 7-11). But installation did not begin until late Thursday because of a delivery delay. The new tables are the same as the ones they are replacing, according to C-A assistant superintendent Russ Parks. The mobile folding tables are designed to store vertically in recessed wall niches. That allows floor space in the room to be used for other purposes.